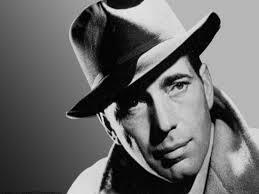 September has been a Bogart month on Fridays in MSAS! This year's classic movie season kicked off with The African Queen (1951), in which Bogart stars with the iconic Katherine Hepburn in this unforgettable film directed by John Huston. Next came Sabrina (1954), in which Bogart is cast against type as the romantic lead, in a light-hearted comedy directed by Billy Wilder. This week MSASers will enjoy what is considered to be the first film noir detective drama, The Maltese Falcon (1941), with Bogart and Mary Astor. This is the first film directed by John Huston, who up until this film he was a screenwriter. October will be a strong leading ladies month, with films that include Born Yesterday with Judy Holiday, Singing in the Rain with Debbie Reynolds, Sunset Boulevard, with Gloria Swanson, and The Philadelphia Story with Katherine Hepburn. Suggestions for must-see films are always welcome as are parents or other visitors who have a particular film-related interest or expertise they might be willing to share with our fledgling film buffs! Newer PostLEGO WALL IN ASEP!